Imagine this scenario: your company is preparing for organizational change now or in the coming months. Maybe you need to restructure in order to drive greater productivity and revenue. Or perhaps change management is necessary at your firm to complete a large merger or acquisition, smoothly and effectively. Regardless of the reason(s) for business transformation, it's rarely an easy process. 1. Design the change management program for your company’s needs. 2. Communicate with key stakeholders. “If you think your company’s strategy conversations should only take place at the most senior level, you could unknowingly be crippling your company’s bottom line,” the source states. 3. Identify the resources to lead change effectively. 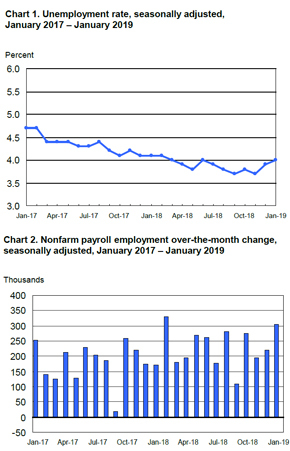 The first month of 2019 picked up where 2018 left off in terms of job growth in the U.S., with the number of nonfarm payroll jobs added by American businesses surpassing the strong figure seen last December: Per data from the Bureau of Labor Statistics' latest Employment Situation Summary, U.S. organizations brought on 304,000 new workers in January. CNBC reported that a Dow Jones survey of economic experts initially expected about 170,000 jobs added. While this is slightly below the total of 312,000 originally reported for December 2018, the newest report revised that month's gains down to 222,000 and brought November's comparatively modest figure of 170,000 up to 190,000. Although the unemployment rate rose marginally between December and January - from 3.9 to 4 percent - this was attributed to a surge in the number of Americans actively looking for work, rather than any troublesome trend. Additionally, the partial shutdown of the U.S. federal government turned out to not affect overall employment to any statistically significant degree - beyond an 11 percent jump in the number of underemployed persons (those working part-time out of economic necessity). With that said, it's worth noting that the BLS considered those who worked without pay or had been furloughed during the shutdown to have been fully employed, because their last paycheck came January 12, 2019, which was within the survey week for the report. As such, any full accounting of the shutdown's economic effects (or lack thereof) on the economy remains unknown, and there is still the potential for another shutdown in a few weeks, considering that the bill to reopen the government only included appropriations lasting until February 15. The leisure and hospitality industry led all other U.S. employment sectors in jobs added during January by a significant margin. Its massive gain of 74,000 positions was fueled not only by food and drink services but also by new opportunities in amusements, gambling and recreation. Construction came in second place with 52,000 new jobs created across all of its employment subcategories, and healthcare was not too far behind with an addition of 42,000 positions. Several other sectors also experienced notable surges in job creation, such as the dependably strong professional and business services industry, which added 30,000 new positions to its payrolls across the U.S.
Transportation and warehousing increased almost as much with the creation of 27,000 new roles. Rounding out sectors with noteworthy professional additions were retail trade, manufacturing and mining, which brought on 21,000, 13,000 and 7,000 new workers, respectively. No other industries saw their labor forces rise or fall by any empirically significant level. There were a few less positive indicators found within the latest BLS report. Wage growth, for example, was somewhat slower than expected, with a 3 cent increase in the average American hourly wage representing growth of just 0.1 percent - under the 0.3 percent predicted by various economists. On a year-over-year basis, earnings have grown 3.2 percent between January 2018 and 2019. Some business leaders may also find themselves perturbed by the sudden switch to a cautious stance by the Federal Reserve, characterized by Fed Chair Jerome Powell's January 31 statement that the central bank would not raise its key interest rate to start the year. According to NPR, Powell cited factors including the impending upheaval of Brexit and various trade disputes around the globe - including the arguments between the U.S. and China - as motivations for the Fed's decision. Regardless of the Fed’s position, the economic picture for the U.S. at the start of the new year is undoubtedly positive. The U.S. workforce experienced historic gains in 2018 as more than two million jobs were added, and wage increases began to accelerate, according to the monthly ADP National Employment Report and quarterly Workforce Vitality Report. The unemployment rate stood at 3.7 percent in November, a near 50-year low, which made it difficult for companies to bring in both permanent and short-term, highly-skilled talent. This trend is expected to continue into the new year as the talent pool continues to shrink. As organizations become more agile, they will have a greater reliance on contractors to help bridge the skills gap. Companies across all industries are embracing this trend, with an emphasis on accessing skilled, mission-critical talent. According to Staffing Industry Analysts Workforce Solutions Buyer Survey 2018, respondents report that 22 percent of their staff is currently contingent and project that by 2028 that figure will rise to 30 percent. Factors contributing to this trend include increased turnover and low employee engagement, especially among younger workers. As a result, some businesses are moving away from trying to keep employees around longer and are instead reducing costs associated with turnover and embracing the gig economy. It is particularly prominent in industries that have changing labor demands for different projects - one project, for example, may need 15 people while another may need 150. “Employers need to assess the right mix of traditional fulltime workers and contractors to best meet their business objectives,” says Tim Ozier, senior director of contract staffing sales for MRINetwork. The tech landscape is richer today than it was when 2018 began, largely thanks to the contributions of professionals within the industry. The sector appears poised to make the most of these gains in the coming year. From coast to coast, the recruitment hunt is on in information technology. This isn't too much of a surprise in places like Silicon Valley and Seattle, Washington, but comes as a most welcome turn of events in places that aren't as well known for technological innovation. Case in point: the Badger State. As reported by the Green Bay Press Gazette, several Wisconsin companies are eager to hire, recent college graduates as well as industry veterans. Brian Hicks, learning and development manager for software developer Skyward, told the newspaper that software engineering is burgeoning. "If you want a job right out of college making a good income, software engineering is the way to go," Hicks explained. "It is absolutely booming." The Green Bay Packers are on the tech bandwagon as well, having teamed up with Microsoft to develop an innovation center in the eastern portion of the state, the newspaper reported. It isn't just tech companies that are hiring, either. Businesses that specialize in other goods and services are also providing more opportunities for technology professionals to exercise their talents because tech inhabits virtually everything. Cybersecurity, cloud computing, mobile development and business intelligence are just a few of the positions that businesses are hiring for in 2019 and perhaps beyond. Tech companies command an ever increasing percentage of cities' land mass, suggesting that the industry shows no signs of slowing. In the first six months of 2017, 42 percent of the country top 100 leases were possessed by technological businesses, according to Cushman & Wakefield. Austin, Texas and Durham, North Carolina are among the cities that have experienced a surge in tech business development. But Jason Ruckel, a student at the University of Wisconsin-Green Bay, told the Press Gazette he has no intention of leaving the area when he graduates. "People need to realize we have businesses here doing the same things they're doing on the coasts - lots of innovation, a startup culture - but closer to home, and the cost of living is lower," Ruckel said. This suggests that instead of relocating to major metropolitan areas for tech opportunities, professionals may be able to find them in places nearer to where they live. Job growth in October 2018 surpassed September's numbers and economists' projections for the month. In its Employment Situation Summary, the Bureau of Labor Statistics reported Nov. 2 that nonfarm payroll employment rose by 250,000 in October. This is significantly higher than Wall Street analysts' prediction of 195,000, as reported by The New York Times. Michelle Girard, chief U.S. economist at NatWest Markets told The Times, "The underlying fundamentals of the labor market are still really bright, it's really the strongest part of the broader economy at the moment." October 2018 represented the 97th consecutive month of job growth in the U.S.
Hurricane Michael, which caused destruction in the northwestern region of Florida, had no recognizable impact on the national employment rates for October. However, jobless claims in Florida and Georgia rose by 10,000 following this storm's landfall. The unemployment rate did not change from September's 3.7 percent. This number represents the lowest figure since December 1969. This amount, as well as the impressive job growth of the month, may influence American voters going into the upcoming midterm elections. The largest job growth statistic comes from an industry that suffered in September: leisure and hospitality. The sector rose by 42,000 jobs. This is a dramatic rise in comparison to September's numbers, which were likely impacted by Hurricane Florence. Healthcare took second place in October, with the addition of 36,000 positions. This job growth occurred in a variety of settings, with 14,000 job gains in ambulatory health services, 13,000 in hospitals and 8,000 in nursing and residential care facilities. The professional and business services industry forfeited its previously first place standing when it gained 35,000 in October, a distinguishable drop from its job growth of 54,000 in September. With the fourth largest job growth in October, the manufacturing industry added 32,000 jobs, 10,000 of which occurred in the durable goods sector. Employment in construction experienced an increase of 30,000 in October, a significant change from its rise of 23,000 in September. Transportation and warehousing displayed a slight expansion in October, with the creation of 25,000 jobs. Meanwhile, the mining industry remained stagnant, with an increase of 5,000 new jobs. Other industries, such as retail trade, wholesale retail, financial activities, government and information did not change significantly in October. Average hourly earnings of all employees on private payrolls increased by 5 cents, or 0.2 percent, in October, rising to $27.30. This is indicative of a 3.1 percent increase over the past 12 months. It seems to be on-pace with the Consumer Price Index for All Urban Consumers, which increased by 2.3 percent from September 2017 to September 2018. The creation of jobs and all-time-low unemployment rate are impressive during this month. Business leaders, job seekers and economists in the U.S. should be pleased with the current state of employment. As a result of the continually growing economy, interest rates from the Federal Reserve are likely to keep rising. A CNBC report stated, "Powell [Fed chairman] says we're 'a long way' from neutral on interest rates, indicating more hikes are coming." The CME Group provided a 75 percent probability of a rate hike by the end of 2018, likely in December. If you insist upon finding a candidate you don’t have to train, you could add months to your search for a new hire. You could probably train someone in that amount of time while also benefiting from the value that person may add in other ways as they ramp up. Look for coachable, high potential candidates who have transferable skills that will help them overcome the lack of specific experience. According to the 2018 MRINetwork Performance Management Study, nearly 80 percent of the employers surveyed agree or strongly agree that finding quality industry-experienced talent is more difficult than ever, and that their companies are more likely to hire people who have transferable skills, but lack industry experience. By considering those with transferable skills, you can significantly expand the number of applicants and focus on more general skills, such as organization, teamwork and communication, which might be just as important for the role, but are much less teachable than specific, technical skills. Both employers and candidates see poor communication as a problem in this area, according to the study. Companies need to make it clear they are open to candidates who have applicable expertise, despite their lack of industry experience. Candidates need to focus on how they discuss transferable skills during the interview process and demonstrate how those skills can be applied to a different industry. When smartphones were first mass produced in manufacturing and distribution centers, millions of Americans said, "I gotta have that." Fast forward to the present, and the vast majority of gadget-crazed consumers own these devices - nearly 80 percent of the country, in fact, according to the Pew Research Center. Making a strong case for second - if they haven't already caught up - are voice-activated assistant devices, a trend poised to foreshadow an uptick in employment and recruitment in several industries to satisfy buyer demand. From the iPhone's Siri to Amazon's Alexa, voice-assistant technology is all the rage these days. In fact, approximately 95 percent of respondents in a recent poll conducted by PYMNTS.com and Visa acknowledged owning one or more of these gadgets, which can perform various functions simply by speaking to them. The uptick in ownership has been particularly notable in recent years. For example, 27 percent of respondents in the survey said they possessed voice-activated speaker systems, up from 14 percent in 2017. Younger millennials - defined as those whose age range between 18 and 29 - are the most likely consumers to be using voice-based tech assistants, more so than so-called "bridge millennials" and early Generation Xers. "11% of broadband households intend to purchase smart speakers within the next year." Although technologies like Siri and Alexa have been around for several years, it's clear that the novelty factor hasn't worn off. To the contrary, new research suggests that among households with broadband internet connections, 11 percent intend to purchase smart speakers within the next year, according to a separate study from Parks Associates. "The consumer market first encountered voice control through smartphone-based voice assistants, which consumers report as the preferred method of voice control for smart home devices," said, Dina Abdelrazik, Parks Associates research analyst. "These experiences drive demand for new voice-based experiences." It comes as no surprise, then, that employment in manufacturing, assembly and distribution centers has risen - a trend that's expected to continue for the foreseeable future. This past summer, Amazon announced its plans to develop a fulfillment center in Eastern Washington, the e-commerce giant's debut in this portion of the Evergreen State. The project is expected to add over 1,500 full-time jobs to the state's economy. The fulfillment center - projected to span 600,000 square feet - is necessary to keep up with buyer demand, the company stated. Employees at the facility will work in concert with Amazon Robotics to package and prepare orders for customers. Although consumer technology represents only a portion of what Amazon and other factory settings mass produce for buying customers, it accounts for a sizeable share of annual earnings, evidenced by quarterly sales figures. However, manufacturers and suppliers can only deliver on what tech experts develop. This may explain why employment in the tech industry has proliferated. Through the first six months of 2017, for example, tech companies accounted for nearly half of the square footage office space signings among the leading commercial leases in the U.S. and Canada, according to estimates from Cushman & Wakefield. Revathi Greenwood, head of research at Cushman & Wakefield, said robust tech employment isn't confined to the general sector itself, but to multiple others, including law firms, media conglomerates and most especially retailers. What does the future look like voice-assist devices? Thanks to the ingenuity of the people that design them and the employees participating in assembly, vital signs are strong. Amazon, for one, announced added intelligent features in Alexa-enhanced Echo devices in September, including updated email management, video doorbell and step-by-step cooking instructions. "We've only scratched the surface of A.I.-powered inventions, said Rohit Prasad, head scientist and vice president of Amazon Alexa. "We'll continue to invent ways to make Alexa more useful for our customers." Job creation in September 2018, in terms of raw numbers, did not reach the heights of August or some of the year's other most robust periods. 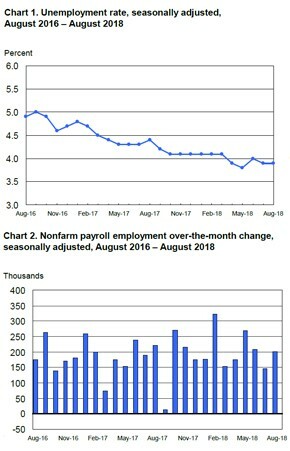 The Bureau of Labor Statistics announced that nonfarm payroll businesses in the U.S. brought on 134,000 new workers during the month in its latest edition of the Employment Situation Summary, considerably less than August's 210,000 jobs. Also, the number failed to meet economists' expectations: Bloomberg's survey of economic experts had projected 185,000 new positions created, while The New York Times reported that Wall Street's general estimate was more conservative (168,000) but still greater than the final result. However, a number of seasonal and situational factors that do not reflect the broader direction of the American economy are the most direct causes of slowed job growth, not least of which is the impact that Hurricane Florence had on several states along the eastern seaboard. Additionally, the BLS noted that the survey periods during which the agency collected its data on employment and unemployment directly coincided with the storm's landfall, which may have adversely affected initial results. Figure adjustments to account for such anomalies, which routinely occur after the initial release of the Employment Situation, may thus reveal more positive numbers. Meanwhile, the unemployment rate fell in September to reach a new low for the year: 3.7 percent. As noted by the Times, this figure isn't merely a landmark for 2018, but also the lowest jobless percentage on record since 1969. Speaking with Bloomberg, Alan Krueger, former leader of the White House Council of Economic Advisers to President Barack Obama and a noted economics professor at Harvard University, said mitigating factors impacting the numbers should not detract from an ultimately positive conclusion. "The markets could give this a little bit of a pass because it's not clear what impact the hurricane had at the moment," Krueger told the news provider. "I would view this as a full-employment jobs report." The industries responsible for the latest round of job growth should come as no surprise, based on trends within the U.S. economy over the past 12 to 18 months: Professional and business services was well ahead of all other fields for the third month in a row, adding 54,000 positions in September and beating its own gains from the month before by 1,000. Healthcare took second place yet again, albeit with 26,000 new jobs - less than half the growth seen in the No. 1 sector. Meanwhile, transportation and warehousing surged ahead after several months of no statistically significant activity to create 24,000 positions, and construction was right on its heels with 23,000 new jobs. Manufacturing and mining also added staff to their payrolls in September - 18,000 and 6,000, respectively, with the latter mostly dependent on support-services positions for its job growth. No other sector saw any meaningful increases. In terms of losses, a drop of 17,000 workers in leisure and hospitality stood out as the only notable labor decline, and can be attributed at least in part to Hurricane Florence and the transition from summer to autumn that often produces staff cuts. Average hourly pay increased by 8 cents, or 0.3 percent, from the previous month, per the BLS's figures. This represents a 2.8 percent year-over-year increase, which is still less than what one might expect given the breakneck pace of job growth during that time. Nevertheless, economists and business leaders can find much to be pleased with in the overall picture that this data paints, including reinforcement of hopes that the Federal Reserve will raise interest rates one more time before the end of 2018. A recent NPR/Marist survey reveals that 20 percent of work in the U.S. is fulfilled by contract workers. So, no matter what industry your business serves, chances are you regularly employ contractors to augment your permanent workforce. This reality creates a continual need to source consultants, whether it be through an MSP (Managed Services Provider) / VMS (Vendor Management System) or a boutique staffing firm. The use of an MSP/VMS has increased dramatically in the last ten years; the threshold for engaging with an MSP used to be approximately $50 million a year in contract staffing spend, but that number has significantly decreased, and many small to medium-sized companies utilize an MSP program. Despite all the benefits of an MSP/VMS, it can present a challenge to internal hiring managers who need to find contractors quickly, with a very specific skill sets. "Some companies are much more strict and rigid than others when it comes to MSP utilization," said Tim Ozier, senior director of contract staffing sales for MRINetwork. "Some junior level managers may also be more reluctant to try and work outside the MSP program than their senior colleagues." Become very familiar with the MSP/VMS program and its nuances. You might find that the program allows you to attract the contract talent you need, in a timely manner, at the right price. However, many managers have previously established relationships with smaller, boutique recruiting firms with whom they want to continue working. 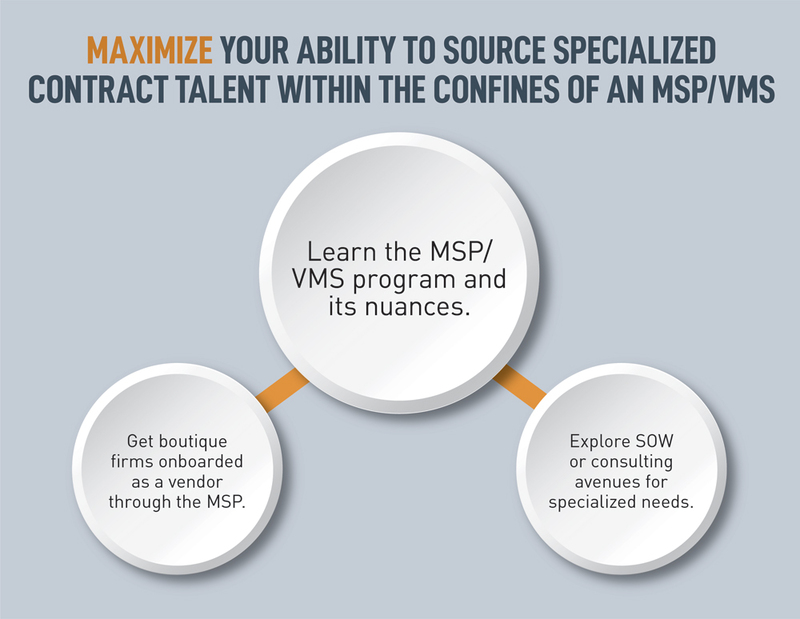 Try to get boutique firms onboarded as a vendor through the MSP program. This can be time consuming and possibly unsuccessful if the smaller firms cannot comply with the vendor requirements. Essentially, you’ll need to justify why it’s critical to bring in highly specialized talent that can’t be sourced through the MSP program. To accomplish this, learn the internal processes and justifications for using non-preferred suppliers. Exceptions can be made and even when the list of preferred vendors are locked down, there is typically a second tier of boutique providers that the MSP can turn to for meeting mission-critical business needs. Utilize the boutique firm for consulting services or SOW projects, rather than staff augmentation since those services frequently fall outside the auspices of the MSP program. In some cases, it can help the hiring manager make a case for using an outside firm if he/she already has an excellent candidate from the firm. The company will usually have another vehicle outside of the MSP for more strategic or specialized biz needs. Many of those needs can be met by a staffing provider. For the past decade or so, big data has taken the tech sector - and much of the business world overall - by storm. The possibilities afforded by large-scale business intelligence for automation, high-level analysis and increased business efficiency have proved to be all but endless. Now, as nations throughout the Asia-Pacific region develop their economies at a furious pace, the demand for big data in these countries is taking off considerably. Citing data from IDC, Forbes stated that business analytics tools will experience a compound annual growth rate of 15.1 percent in the APAC region between 2017 and 2022. Analytics data stores and cognitive/AI software platforms represent the most popular product categories in the overarching field of big data, per IDC's projections, with respective CAGRs of 35.4 percent and 32.4 percent. While most of the demand for this technology is coming from the largest APAC firms, small and medium-sized businesses are also making investments in it. Additionally, there will be a resulting need for more individuals trained in the specific skill sets necessary to leverage such technologies, which could help create tech jobs in these countries. As far as the region's broader economy is concerned, projections remain quite positive. The International Monetary Fund's Regional Economic Outlook for APAC nations projects growth of 5.5 percent, two-thirds of the world's overall economic progression for 2018. "What's worth noting is that even though there still remains a lot of headline noise around politics and protectionism, underneath that, the U.S. economy - and that includes labor markets - is doing quite fine," Gapen told the newspaper. Professional and business services remained the top performer in terms of employment creation among American industries, adding 53,000 jobs during August. Healthcare came in second, with 33,000 new roles added, while construction and wholesale trade were nearly tied with their respective gains of 23,000 and 22,000 jobs. (By contrast to its wholesale counterpart, retail trade, after a few months of back-and-forth, didn't see any major change in August). Some economists will see manufacturing's decline in employment - a loss of 3,000 positions in August - as the biggest surprise in the BLS's latest jobs report. Considering that the field added 37,000 jobs in July and 36,000 in June, as it has for nearly a year starting in 2017 and continuing through to 2018. Any drop counts as a notable negative change in light of a White House administration under President Donald Trump that repeatedly pledged to bring back manufacturing jobs - and also, with good reason, has cited economic gains as its biggest success. This could be attributable to a slight drop in the labor force participation rate, which fell 0.2 percent to reach 62.7 percent. That said, a loss of 3,000 roles could easily be offset by even a relatively modest jobs gain for September. The August BLS report also contained other significant positives. Wages grew by 0.4 percent when analyzed by average hourly earnings, rising 10 cents to reach $27.16. When looked at on a year-over-year basis, the gain is even more impressive - 2.9 percent between August 2017 and 2018. According to Staffing Industry Analysts’ Workforce Solutions Buyer Survey 2018, respondents report that 22 percent of their staff is currently contingent, and project that by 2028 that figure will rise to 30 percent. As the blended workforce continues to grow, it's becoming increasingly important to perfect your company’s recruitment strategies to consistently hire strong permanent and contract candidates that will drive business growth. No matter what industry you focus on, the ability to implement an effective contingent workforce recruitment strategy that is part of your overarching hiring plans is essential for success in today's competitive job market. "Many newer companies make the mistake of assuming that coming up with an effective contingent talent acquisition strategy can happen overnight," said Tim Ozier, senior director of contract staffing sales for MRINetwork. "The reality is that identifying hiring needs, searching for right-fit candidates and screening takes extensive time and consideration. Generally, the most successful strategies unfold with the help of staffing companies." Today's workforce looks much different than it did even several years ago. With the onset of remote work, the gig economy and the appeal of telecommuting, it's becoming rare to find a company filled completely with full-time, in-office employees. From the top down, organizations and employees can reap the benefits of a mixed workforce but first, your company needs to be on board with this kind of work environment. One way to do this is by including discussions around the blended workforce during planning sessions with the entire organization. Demonstrating how contingent workers can help drive the organization's bottom line, while cutting costs at the same time is key. In many cases, contingent workers are hired for projects that could not be completed by existing staff. Overall, creating clear means of communication across all sources of workers is beneficial. If companies continue to view this pool of candidates as merely temporary, they are largely missing out on the talent that is today's world of extremely skilled top performers. While you may only think of contingent workers as one-time fixers, merely filling a gap in talent while saving on costs, you’re losing out on the wealth of knowledge these highly skilled workers have to offer. "Both organizations and contingent workers benefit greatly from contract staffing," said Ozier. "Many times, the relationship and outcome is so great, these employees are later hired as permanent workers." Industry focus is key for finalizing your recruitment strategy and the best way to do this is by working with a staffing organization. Not only do these agencies have working relationships with top talent, but they understand the specific skill sets needed in your given industry. When it's the top candidates within your sector you're looking for, staffing organizations can help you find them. Instead of training an inexperienced worker, you gain access to the right candidate for the job at hand. The recruitment firm takes care of all the talent sourcing, background checks, and preliminary interviewing activities to deliver highly qualified workers. For both permanent and contract work, this single-source solution can help you implement the best contingent workforce recruitment strategy. The U.S. saw yet another considerable monthly surge in the size of its labor force in June 2018. 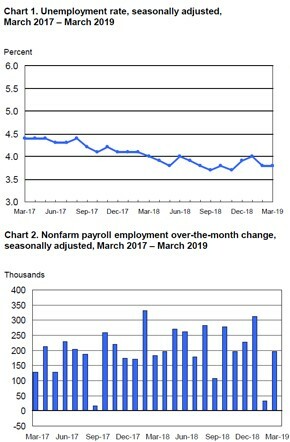 According to the Employment Situation Summary from the Bureau of Labor Statistics, nonfarm payroll across all American industries added 213,000 jobs during the month. This is slightly less than May's tally of 223,000 new positions, but a strong number exceeding the median figure projected by a Bloomberg survey of economic experts, who expected approximately 195,000 jobs added. Although the unemployment rate rose from May to June - coming in at 4 percent after May's remarkably low figure of 3.8 percent - many are attributing this to growth in the labor force participation rate, which most recently jumped 0.2 percent to reach 62.9 percent. This indicates an uptick in jobless individuals actively seeking work, particularly among prime-age workers (Americans between the ages of 25 and 54). Brookings Institution senior fellow Gary Burtless confirmed as much in an interview with The Washington Post. The field of professional and business services stood well above other sectors of the U.S. economy in terms of increased employment for the month, adding a total of 50,000 jobs. Manufacturing saw the second largest gains, creating 36,000 new positions once again on the back of durable goods manufacturing. This smaller category of the field has reaped major overall benefits for the American manufacturing industry, in terms of both revenue and employment. 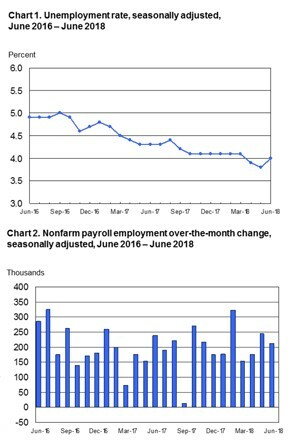 Healthcare - another consistent performer on the U.S. job market and general economy over the past few years - added 25,000 new positions to its labor force in June. Meanwhile, construction rounded out the group of sectors with five-figure job gains due to the 13,000 new roles it created, and mining was the only other industry with statistically significant employment growth for the month, adding 5,000 jobs altogether. The only notable drop in total jobs for June occurred within the sector of retail trade - a loss of 22,000 positions. However, because this field of the American labor force added 25,000 jobs during May, any impact on the businesses within it would be minimal. Additionally, seasonal labor shifts, which are common in retail, are almost undoubtedly responsible for some of June's job losses. This reduces the likelihood that the drop-off is the beginning of any alarming trend - though it's too early to know all of the exact causes. Speaking with Bloomberg, Michael Feroli, chief U.S. economist at JPMorgan Chase & Co., offered a largely positive but nuanced take on the newest numbers from the BLS. "This is a good job-creation number, but on the other hand we see still continued soft wage growth," Feroli said. "It's positive in the sense that we still have some capacity to grow above trend without triggering too much inflation worry." He added that the Federal Reserve could interpret these indicators as reasons to maintain its current schedule of increases to federal benchmark interest rates, rather than expanding to four rate hikes for 2018 as many economists have anticipated. Growth in average hourly earnings did slow somewhat during June, with the month's 5 cent increase representing a 0.2 percent decline from May's wage gains. Also, concerns persist among some American businesses regarding potential adverse effects of the recent U.S. tariffs on numerous imports, including $34 billion in new levies placed on goods from China as of July 6, 2018. Yet the full effect of those measures remains to be seen, and in the meantime, the American economy is in a positive place, as it has generally been for the past several years.